The recent web release of the film FITNA by Dutch Politician Geert Wilders was hosted on British run website LiveLeak.com and has since been removed (although the link still works) due to death threats against its staff. This is the statement from LiveLeak’s website. Following threats to our staff of a very serious nature, and some ill informed reports from certain corners of the British media that could directly lead to the harm of some of our staff, Liveleak.com has been left with no other choice but to remove Fitna from our servers. This is a sad day for freedom of speech on the net but we have to place the safety and well being of our staff above all else. We would like to thank the thousands of people, from all backgrounds and religions, who gave us their support. They realised LiveLeak.com is a vehicle for many opinions and not just for the support of one. Perhaps there is still hope that this situation may produce a discussion that could benefit and educate all of us as to how we can accept one anothers culture. I have watched the 15 minute film and it is a compilation of verses out of the Quran calling for violence, footage from terrorist activities, and Muslim leaders preaching violence against Jews and Christians. Geert Wilders has already been targeted with assassination before, but is much more likely to face it after releasing this film. He also faces some copyright charges, but that’s irrelevant if he’s killed for this. The film is very damning against radical Islam and seeks to have the Quran banned in Holland for the same reason that Mein Kamph was banned. It’s isn’t very well made, but it is powerful. Geert Wilders has a right to say what he thinks without being threatened with death. The film was downloaded from LiveLeak.com and made it onto YouTube. If you want to watch the film, the two parts are below. It is about 15 minutes long total. I wouldn’t recommend watching it with kids. Recently, representative Michelle Bachmann, a Minnesota Republican, has proposed a bill that would repeal the nationwide phase out of incandescent lightbulbs in 2012. The old-school bulbs are being replaced by the fluorescent energy efficient bulbs. Her bill is called the “Light Bulb Freedom of Choice Act”. This bill is a second chance for Congress not to appear completely socialist. Don’t get me wrong, I like fluorescent energy efficient bulbs for the money I save and the fact that I rarely change a light bulb anymore. I have them in nearly every lamp in my house and most of the ceiling lights. However, as I’m sure many of you know, fluorescent bulbs don’t really dim and they don’t have brightness settings. They are either completely off or completely on. There’s no in between. So with the banishment of the Edison-style light bulb, out goes the concept of a dimmer switch and things like a three-setting light bulb. Unless there is some new technology that I’m unaware of, these things will likely disappear along with the incandescent light bulb. Why would Congress go to such lengths to eliminate something as harmless as the incandescent light bulb? You guessed it….global warming. By eliminating all of the extra energy use of these incandescent light bulbs, we will theoretically burn less fossil fuels to power them and thus we will release fewer greenhouse gases into the atmosphere. So instead of simply leaving it to consumers to figure out for themselves that they save money with the new bulbs, Congress passes a law (that Bush signed) that banishes the old light bulb. Socialism at work. I thought liberals were pro-choice….or is that just when we’re talking about human life? I guess it’s not okay to be pro-choice when it comes to light bulbs. Fortunately, the Bachmann bill (if passed) would stop this nonsense. “This is about freedom, this is about consumer rights,” she said. Yes it is. Fluorescent bulbs pose their own risk with trace amounts of Mercury in them. So, the government effectively forces the elimination of Mercury thermometers from medical use but then turns around an mandates the use of Mercury-laced fluorescent bulbs in every household in the country. Legislative schizophrenia–all in the name of global warming. Global warming is just the latest fad, just like the coming Ice Age was back in the 1970’s. A very recent article published in The Australian gives evidence to the fact that carbon dioxide levels have been increasing over the last ten years, but temperatures globally have continued to fall. This debunks one of the main points in Al Gore’s “An Inconvenient Truth” documentary. How very inconvenient for the global warming folks (or is it global climate change….oh, I can’t make up my mind). The point is that the death of the incandescent light bulb is just one of the first casualties in this global warming hoax to control our lives. Next will be the government controlling your thermostat in your house, then controlling what kind of car you drive, then controlling how much you drive. If this is something you look forward to, please save the rest of us and move to Europe now. You’ll get more than your fill of 15% unemployment, 60% income tax rates, and free (lousy) healthcare for all. Republicans are crossing over to vote in Democratic primaries for Hillary Clinton, not because she can get the delegate lead, but because an Obama-Clinton deadlocked race going all the way to the Democratic National Convention would benefit the Republicans. The primary objective of Operation Chaos is simply to create chaos in the Democratic party–nothing more. It isn’t to get Hillary or Obama selected as the opponent in November. The nominee will be left up to the Superdelegates in the Democratic Party to pick. There are even some calling for an early Superdelegate vote to avert such a disaster. So, this is how this “operation” is working. The battle in the Democratic party is embittering many of the supporters of Obama and Clinton and is drawing attention away from McCain for a while, allowing him to establish his positions without any major scandals that usually accompany any presidential campaign. Also, the Democratic National Convention is only 8-9 weeks before the general election, so if the race is still undecided by convention time, the Democrats will be forced with cramming an entire general campaign in that two month time period. Not an easy task considering that candidates from each party historically move towards the center after wrapping up their party’s nomination. The Obama-Clinton battle is forcing each of them to move further and further left. It will be virtually impossible for either to move back to the political/ideological center in an eight week time period. The new poll today released by Rasmussen shows that 44% of Democratic voters want either Obama or Hillary to drop out of the race now. 22% believe that Obama should drop out and 22% believe that Hillary should drop out. An even more interesting number is 6% believe that both Hillary and Obama should drop out of the race. What if both were to drop out? You guessed it…Al Gore would be the presumptive nominee. This race may be headed that way eventually. There are already inside talks going on inside the DNC that could lead to Al Gore getting the nomination with either Hillary or Barack as the Vice Presidential pick. This, of course, is a long shot but the possibility remains. A similar thing happened in 1968 with presidential nominee Hubert Humphrey. Humphrey was nominated as the Democratic Presidential nominee but never won a single primary before the convention. 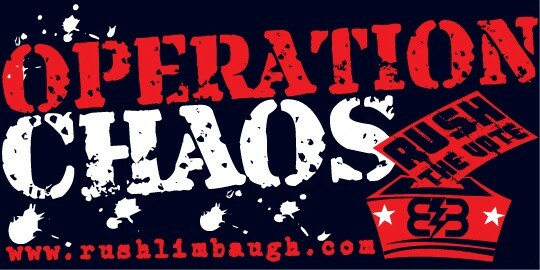 Various news agencies have reported that Operation Chaos is working and others are reporting that it isn’t. Tough to say in the end whether it is really having a major impact, but it certainly appears to be and it’s even got Democrats in Ohio attempting to indict Rush Limbaugh and voters who switched over for voter fraud. One thing is clear though–there is more chaos in this election than there was a few months ago. The longer this goes on, the better the Republican chances are in November. Hillary Clinton often gives the example of her Bosnia trip twelve years ago as evidence of her experience. While First Lady she reports flying into Bosnia and arriving under sniper fire in the airplane and then being rushed into vehicles to carry her away from the airstrip. The only problem is that it never happened. Hillary seems to have dreamed up this grandiose illusion that she actually faced mortal danger as the First Lady and somehow that gives her the experience to be President. This exaggeration/lie is only one of many of Hillary Clinton’s whoppers that she expects us to believe. My personal favorite is her claim that she plays pickup basketball. Right, I’ve seen plenty of 60 year old multi-millionaire women playing pickup basketball. She was named after Sir Edmund Hillary. who climbed Mount Everest. She was a Yankees fan when she lived in Chicago. She claimed on Sept. 11 daughter Chelsea was jogging around the World Trade Center. We will see how savvy the Obama campaign is if he chooses to tackle some of these blatant fabrications. Of course, Obama’s got some credibility problems of his own so he may just lay low on this one and allow the voters to figure it out on their own. On Easter Sunday, six protesters of the Iraq war decided to stage their protest at Holy Name parish during Catholic Mass. Their tactic? Squirt fake stage blood on themselves and nearby worshipers during Mass. Despite their male and female membership, they referred to themselves as Catholic Schoolgirls Against the War. Their actions are an insult to real Catholic schoolgirls as anyone with a third grade education could have staged a much more intelligent and effective protest. When I was in sixth grade, I specifically remember reading in my science book about global cooling and the coming Ice Age. Some things change and some others never do. One thing that changes on a regular basis is science. When I started medical school, I was told that more than half of what I was taught during medical school would be proved incorrect by the end of my career. This is not an anomaly for just medicine. You see it throughout all fields of study when you are dealing with inexact sciences. The study of weather is certainly not exempt from this. If you think the people that study weather really have a firm grasp on what is going on, just watch the weather report on the local news for a few weeks and you’ll change your mind. One thing that never changes is the desire by some to control the masses through environmental nonsense. In our current day and age, one of the ways this is manifested in the hysteria of man-made global warming. We are told that we must cut down on greenhouse gas emissions by cutting energy consumption presumptively by eliminating fossil fuel use. We are told that we must embrace “green technology” and buy hybrid cars to save the earth. This global warming hysteria continues to reach magnitude proportions in our government and has already manifested itself in a bill that permanently bans the incandescent light bulb a few years from now (sorry Edison!). Congress is pondering passing a law mandating fuel emissions to reach somewhere around 50 miles per gallon on all cars manufactured in this country. If that isn’t the quickest way to destroy the auto industry in this country, I don’t know what is. Global warming, or global “climate change” as some like to call it is actually far from a scientific consensus. Scientists that do not prescribe to global warming are ridiculed, ostracized, and silenced. The Weather Channel founder, John Coleman, called man-made global warming the greatest scam in history. Proponents of this global warming hysteria have a specific goal of politicizing the weather, because if you can politicize the weather, you can control everyone. There’s a tornado–it must be OUR fault for global warming. There’s a tsunami–global warming. There are wildfires across California–global warming. Hurricane–global warming. In what must be discouraging news for the man-made global warming crowd, Michigan had the snowiest winter EVER this year, or at least since they started recording snowfall in 1880. Milwaukee had 95.4 inches of snow this year, the second highest amount on record. In even worse news for Al Gore and company, the National Oceanic and Atmospheric Administration (NOAA) has reported that all of the allegedly “lost” ice has now returned to the polar ice caps. Is it just an anomaly that we are experiencing one of the coldest winters on record in the last century? While I’m not saying our earth hasn’t warmed a degree or two overall in the last hundred years or so, Jupiter, Neptune, Mars, and Pluto have also been warming. So are we to assume that our greenhouse gases are affecting other planets or just our own? I guess the possibility of our own sun causing the earth to become warmer or cooler is just too obvious. Of course, if the sun were causing it, there wouldn’t be a thing we could do about it and there wouldn’t be any money or political power to be gained over the illusion that we are at fault for it. If the sun is going to get infinitely hotter, then we’re screwed no matter what we do. Please follow along closely through this presidential campaign to the promises made by the candidates to stop man-made global warming. This is actually code language for more government regulation on businesses and private citizens leading to a worse economy than we are already in. All the candidates are guilty of it–McCain, Clinton, and Obama. They’ve already taken away the incandescent light bulb because of what is likely junk science–don’t let them take away our SUV’s. They’ve already mandated that we use ethanol, despite studies showing that it actually puts out more greenhouse gases into the environment than just regular gas. What is next? The government controlling the air conditioner in our home? In twenty years we are going to look back and this and laugh when we realize that science changed it’s mind again and there was no global warming crisis after all…unless of course we’ve completely changed our lives and our lifestyles over a manufactured crisis. Then instead of laughing, we might be crying. Bill Richardson, former Democratic Presidential candidate, formally endorsed Barack Obama for President today. This actually came as somewhat of a surprise to me as Clinton and Richardson have been very close for a long time. I was surprised at the brazen act of disloyalty to the Clintons and the purely political move that it was. Until now, I never saw Richardson as a particularly savvy politician, but I guess he got some good advice. He knows that Obama is going to be the eventual nominee and he wants to get on his good side early. Richardson would be a particular “prize” as a VP nominee as he is from a Hispanic background–not to mention he’s a way better and more experienced overall candidate than Obama. Since this presidential race seems to be more and more about identity politics and the racial make-up of the candidates, I wouldn’t be at all surprised to see Obama pick Richardson as his VP. Democratic political advisors would surely see this as a way to sure up the Hispanic vote in this country. If Richardson is Obama’s eventual VP pick, tune into any news station of your choice immediately afterwards to be reminded that Richardson is Hispanic and how this is going to draw Hispanics in mass numbers to vote for the Obama-Richardson ticket. Hopefully, Hispanics won’t fall for it because there are a lot of other reasons to vote for or against a candidate other than his racial background. Politics in this country is really pathetic sometimes. Yeah, I bet it did. I wonder if Hillary cried during or after the phone call? She might have if there were television cameras around…that would have gotten her at least another 5 percentage points in the next primary.